The “‘My First’” Barbie appeared on the doll scene in 1980 or 1981. Her box has the 1980 copy­right date, but that of­ten means the doll was not available for sale until the following year. Whatever the correct date, most mothers agreed it was about time such a Barbie came on the market. Barbie was already the most famous doll ever. She was recognized worldwide as being the leading doll seller of all time. No one—whether great-grandparents or three-year-old children—needed an ex­planation as to who she was because everybody knew. So what was the problem? Barbie was hard to dress! Older children included the popular doll in their play world without a care, but for millions of younger girls, who weren’t as manually adept yet, it was quite frustrating. Barbie’s clothes were so tiny and fit so perfectly that getting them on and off became more a chore than a fun pastime. It was also agitating for parents. Being the good moms and dads they were, they often found themselves having to be the doll dressers be­cause it just wasn’t working for their little ones. Hair was another “easy” feature on the “My First” Barbie. The original hairdo was not elaborate, and the hair was smooth and could easily be combed over and over with a comb and brush, which were included in the packaging. 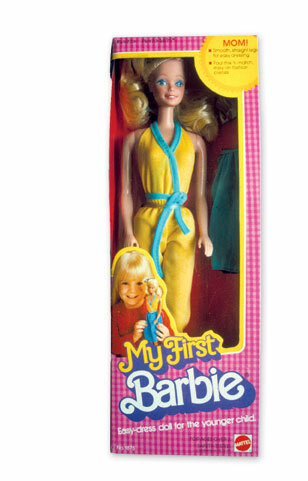 Produced only as a blonde, the number-one original “My First” Barbie had a middle part and two ponytails. Her clothing was a yellow wrap bodysuit with turquoise trim and yellow mules. Extra fashions in her box consisted of matching yellow pants, a turquoise knee-length skirt and a multicolor stripe sleeveless top. 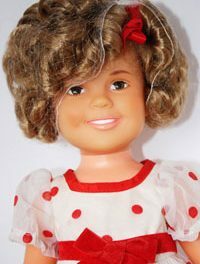 Her popularity with children and adults alike was clear when Mattel expanded the “My First” line by adding outfits for the doll that could be purchased separately. All these wrapped, snapped and tied quickly and easily. A new boxed edition went on the market in 1982. 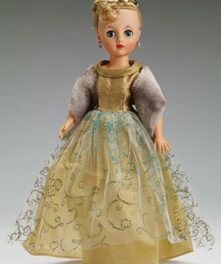 The doll was the same, but the clothing was pink and white—a sleeveless bodysuit with white lace trim at the bodice and sleeves. For a change of pace, a pink-and-white gingham, full, knee-length skirt was included along with hot pink mules. Two years later, in 1984, “My First” Barbie was wearing a white short- sleeve, knee-length dress with pink ribbon trim and lace edging at the neck. On her feet were dainty pink pumps. This doll’s hair was pulled back at the front and sides, and tied with a pink ribbon. The rest of her hair flowed down the middle of her back. That same year saw the beginning of the African-Am­erican “My First” Barbie line. The Hispanic Barbie head was used on this model and would be used until 1988 when the decision was made to use the Christie head. At the same time, the Hispanic head was used on the new Hispanic model. Asian models were added by 1993. Faces differed, but clothing did not. Caucasian, African-American, Hispanic or Asian babies of the “My First” line have always been dressed alike. The “My First” Ken did not appear until 1988. 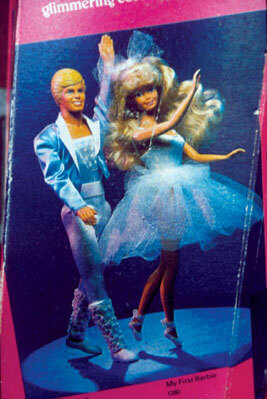 He was quite the handsome fellow, dressed as a ballet partner to that year’s “My First” Barbie. Ballerina dolls have definitely been the most popular theme with these dolls. They have been dressed as dancers in many of the years of their production. By 1992, they were being made with molded white legs, ending the need of slipping leotards on and off. The African-American “My First” Ken danced onto the scene in 1991. Mattel used the African-American Ken head from 1987 for this doll. He was dressed like the Caucasian version in a long-sleeve, light-blue dance shirt with multicolor insets, solid light-blue pants and white dance oxfords. The year 1991 also saw the introduction of the “My First” Barbie Gift Set. This boxed set featured a doll dressed differently than the regular “My First” Barbie of the same year. The regular doll was dressed in a blue ballet outfit. This doll wore a pink with silver glitter dot sleeveless bodysuit with pink tulle and silver overskirt with hot-pink flower trim at the waist. Included in the box with her was a white satin bolero jacket with faux fur long sleeves, a white dotted Swiss three-tier ruffle miniskirt, a purple tank-style drop-waist mini dress with iridescent ruffle skirt and bow at the hip, a green satin strapless mini dress with lace at the neck and hem and a purple bow at the waist, a pink and silver T-shirt with silver star and purple ribbon trim, white lace footless tights, a hot-pink spaghetti-strap bodysuit, a lilac hanger, a lilac oval brush, hot-pink tennis shoes, pink ballet slippers with ribbon ties and wide white pumps. What a play­set it was! Other years during the 1990s, little extras were introduced to the “My First” line. 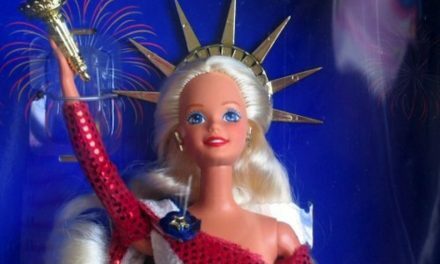 There was “My First” Tea Party Barbie in 1995 and Jewelry Fun “My First” Barbie in 1996. It is interesting to note that through the years all the play Barbie clothes have been simplified, dem­onstrating the influence of the “My First” Barbie line’s popularity. For collectors, these dolls have provided a segment of the Barbie world for which it is not too difficult to gather every example. With the expansion of online auctions, it is easy to find the “My First” Barbie dolls for sale any day of the week, and prices are very affordable. Some of the later issues sell for bottom bids from less than a dollar. Recent prices show a growing interest in the early “My First” dolls. Mint-in-the-box examples have been selling for as high as $35 and above on the Internet. Certainly collectors are interested, but some of the buying is probably by grown-up ladies searching for the dolls of their childhood. It’s something that all of us can understand. What wonderful memories center around the toys we once played with and which helped shape the persons we turned out to be. Was your special toy a doll? Did you have a “My First” Barbie?